Have you recently picked up a lamp shade (with or without the lamp) at a thrift store or garage sale and it just isn't your style or in the best condition? If so, transform the lamp shade into something new with items you have in your home or you can find in your local craft store, such as fabric, paint, buttons, ribbon, or even gold leaf. 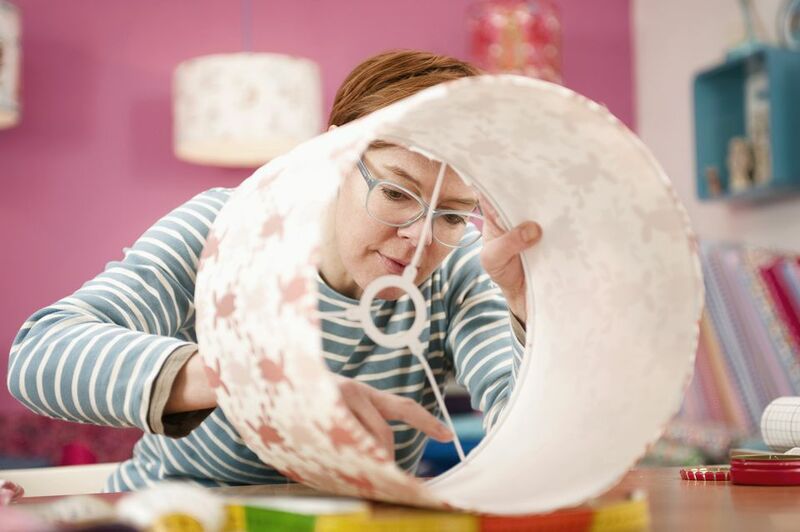 Looking to decorate a lamp shade to better match a room's decor? Cover it with fabric. Pick out a yard of fabric at a local craft store in your choice of color and/or design. If you're on a tight budget, rummage through your craft supplies to find scrap pieces of fabric you can use to decorate your lamp shade. Don't forget the spray adhesive. You'll need it to attach the fabric to the shade. Have an excessive amount of spare buttons? Use your lot of spare buttons to decorate your lamp shade. With some hot glue, carefully glue the buttons onto the shade in a design of your choice. To coordinate with a room's decor, pick out and attach buttons of similar colors and shades. If you're feeling extremely creative, arrange and attach your buttons in a particular design, such as stripes, chevron or even in an ombre effect. It's sometimes hard to find uses for leftover wallpaper. Instead of tossing it, save your leftover pieces and use them to cover the outside of an old or dingy lamp shade. Pick out a piece of wallpaper that matches a room's decor and attach it to the lamp shade with a spray adhesive or craft glue. Remember to let the adhesive or glue to completely dry before putting the shade back on the lamp. Not only do you want to make sure the wallpaper sticks, but also to prevent any messes. Love the designs of modern decorative lamp shades, but not the price tag? Turn a thrifty or old lamp shade into a modern staple item for any room in your home with a stencil and a little paint. Simply pick up a stencil at your local craft store in your favorite design, such as damask, lattice or honeycomb. You can also make your own stencil out vinyl or a thick piece of plastic. Dab on your choice of paint and you've got yourself your very own lamp shade creation. Remember to let the paint to completely dry before re-attaching to the lamp. Want to create a shiny, gold lamp shade to accentuate your dining room, living room or any other room in your home? Apply gold leaf with an adhesive to transform a plain, dingy or old lamp shade into a shiny new staple item for any room. You can cover the entire lamp shade with gold leaf or a design of your choice using painter's tape to mark off areas. Have an abundance of leftover ribbon from other craft projects and gift bags? Reuse your collection of ribbon pieces to quickly and simply spruce up your old or thrifty lamp shade. Attach ribbon to only the rims of the shade to add a little color or cover the entire shade with a single color ribbon or use multiple colors for an added effect. You can wrap the ribbon around the entire shade in a criss-cross, vertical, or horizontal design.